USA Wildwater announces 6 time national wildwater champion Andy Corra from Durango, Colorado is making an attempt on the Guiness 24 hour distance record currently held by world champion adventure racer Ian Adamson www.ianadamson.com/ian/index.php?s=athletic&wr=record. Andy will attempt the record June 24-28th at peak flows on the Yukon River beginning in Whitehorse, YT and finishing somewhere outside of Dawson City. Andy is making his attempt using a Epic V12 Surf Ski, www.epickayaks.com, and will be accompanied by officials certifying his attempt on a chase motor boat and pacer/support crew Jeremy Rodgers, a current US Wildwater national team member. Andy Corra decisively won his 6th national title last year at FIBARK against a youthful field of current and past national team members including youth phenom Peter Lutter and longtime forerunner Mike Freeburn. 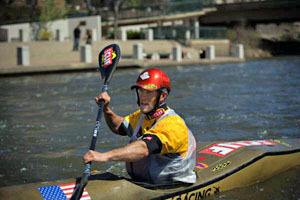 Feel free to contact Andy at corra@riversports.com to wish him favorable weather and much success on his attempt.